سازند بازیاب یکی از واحدهای سنگی کرتاسه در ناحیه خور و بیابانک است که عمدتاً سنگ­شناختی شیل، مارن و ماسه­سنگ دارد. در این مطالعه محتوای پالینولوژیکی سازند بازیاب در برشی به همین نام مورد مطالعه قرار گرفت. این سازند در برش مذکور شامل 1067 متر توالی رسوبی شکل­یافته از مارن، شیل، ماسه، سنگ­آهک و آهک­های ماسه­ای بوده که به‎صورت همشیب میان دو سازند شاه­کوه در زیر و دبرسو در بالا قرار گرفته است. بر اساس مطالعات پالینولوژیکی صورت پذیرفته بر روی 40 نمونه از این سازند، در مجموع 29 جنس و 54 گونه داینوسیست به همراه ۲۰ جنس و ۲۹ گونه از پالینومورف­های خشکی (اسپور و پولن) شناسایی شد که سن سازند را آپتین- آلبین تعیین می­کنند. همچنین حضور فراوان و گسترده داینوسیست­های شاخص محیط نریتیک داخلی به همراه حضور گسترده طبقات شیلی، مجموعه­های روزن­بری پلاژیک و رخساره­های مدستونی و وکستونی بخش­های کربناته گویای ته­نشست سازند بازیاب در محیط شلف داخلی است. The Bazyab Formation is one of the Cretaceous rock units in the Khor and Byabanak area. In this study we investigated palynological content of the Bazyab Formation at the Bazyab stratigraphic section where it is up to 1067 meters thick and consists of marlstones, shales, sandstones, limestones and sandy limestones, claystone, shale and interlayers of limestone. The formation at this section is confined conformably between Shah-Kuh Formation at the base and Debarsu Formation at the top. A total of 40 rock samples have been collected from the formation and investigated for their palynological contents. The obtained palynological data resulted in detection of twenty-nine genera and54 species of marine dinocysts alongside with 20 genera and 29 species of terrestrial palynomorphs (spores and pollens). An age of Aptian –Albian is constrained for the formation in this section on the evidence of recorded palynomorphs. Based on high frequencyof inner neritic dinocysts, planktonic foraminifers and mudstone and wackestone facies of the carbonate beds, an inner shelf sedimentary environment was suggested as the depositional environment of the Bazyab Formation. آقانباتی، س. ع.، 1383- زمین­شناسی ایران، انتشارات زمین­شناسی و اکتشافات معدنی کشور، تهران، 586 ص. 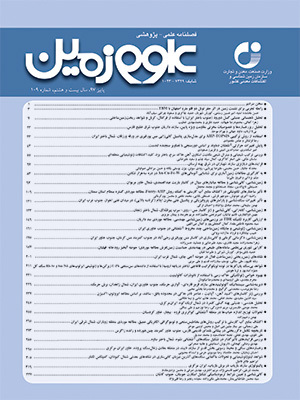 مجیدی‎فرد، م.، 1392- داده­های جدید در باره چینه­شناسی سنگ­های کرتاسه در ناحیه خور (ایران مرکزی)‏، سی و دومین گردهمایی علوم زمین. Akhtari, M., 2011- Palynostratigraphy of two stratigraphic sections in Bāzyāb and Tangal-e Bālā Khur –Biābānak area (Central Iran). Palynological report.804. NIOCEXP. Amiri, F., 2011- Biostratigraphy and Micropaleontological study on the two Stratigraphic Sections in Kuh-e Dadkin and Kuh-e Debarsu (Khur-Biabanak Area) Report 808 NIOCEXP. Haghipour, A. and Pelissier, G., 1968- Geology of the Posht-e-Badam/Saghand area (East-central Iran). Geol.sur.Iran, Geol. note no.48, 144. ‎Khosrotehrani, K., 1977- Startigraphie du cretace Superieur et du Paleocene de la partie mediane de I'Iran (region comprise entre Esfahan-jandagh et yazd) C.R.Sc. Geol. FR., DA. 1977; No.4; PP.239-241. Mohafez, S. and Moshtaghian, A., 1963- Geology and oil possibilities of khur-Jandaq-Biabanak area. National Iranian Oil Company, Report No. 250, Unpublished. Premoli Silva, I. and Verga, D., 2004- Practical Manual of Cretaceous planktonic Foraminifera. In: Verga, D. and Rettori, R., (Eds. ): International school on Planktonic Foraminifera. Universities of Perugia and Milano, Tipografia Pontefelcino, Perugia 283 pp. Wilpshaar, M. and Leereveld, H., 1994- Paleoenvironmental chang in the Early Cretaceous ‎Vocontian basin (SE France) reflected by dinoflagellate cysts. Review of paleobotany and ‎palynology. 84:121-128.